Knowledge is power. This statement holds more true for traders and investors more than ever now. With the multitude of companies, sectors, news and events, it has become important to stay abreast of the latest financial news. This was limited to reading Economic Times earlier, then came CNBC and Money Control website. But reading through these channels now is not easy. Especially when you are looking for information on your mobile. This is where Indian Stock market apps come into the picture. 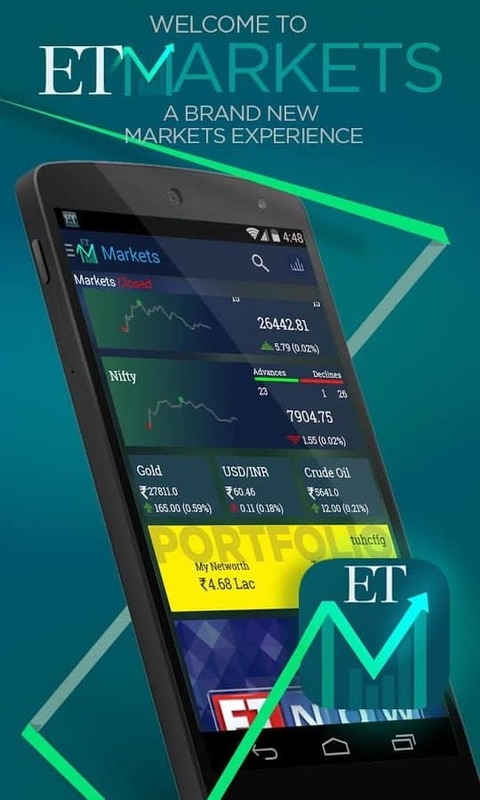 These apps provide information like market price of the stock, any news related to the company or whole market in general, important ratios of stocks, financial details & even technical charts on your mobile. It is like having your own stock screener in your pocket. With high speed internet and cheap data services, these apps are able to provide more information in easy to understand format. Something like this usually takes multiple pages on a normal website to collect. Talk about making the life of traders easy. 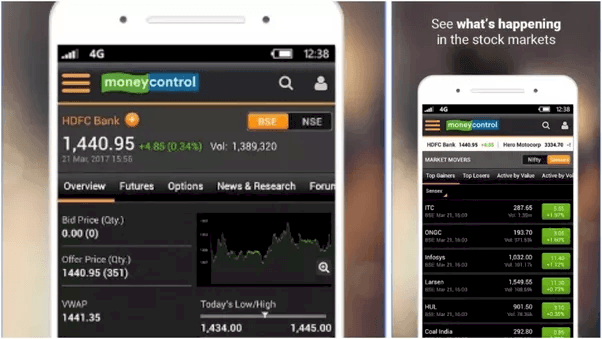 Moneycontrol Market on Mobile (MoM) is a one stop solution. To everything market related. Be it to track the latest updates on Indian and Global financial markets or find detailed information about a particular stock, this app has it all. The app brings real-time quotes on Indian and Global indices, stocks, futures, commodities, both from the MCX and NCDEX, currencies and even mutual funds to your fingertips. As with other apps, you can create your portfolio on this app and track its performance nearly real time with this app. Be it in stocks or mutual funds. 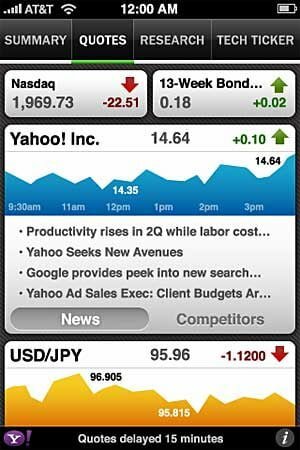 Yahoo Finance is an international app. Which means as soon as you download it you need to choose your country/region and select language to “English(India)” to get Indian Stock market-related information and updates. It has a well researched, well-designed UI which is quite a pleasure to use. 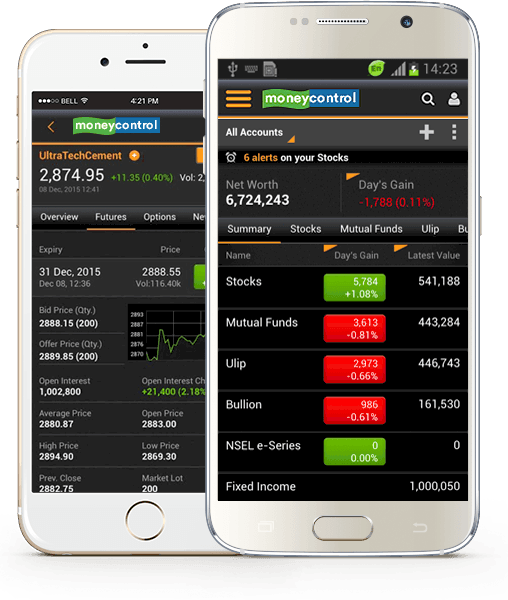 As with Moneycontrol app, you can create a portfolio on this app also. You can add your custom stocks to the list and remove them as soon as they are sold. This was you get quite a personalised view of the growth of your portfolio. The app presents the added stocks as a list, and lets you track them by offering real-time and after-hours data. Also, the app allows tracking industries, commodities and more. Economic Times is the de facto leader in business newspaper edition. They were the late entrant in the stock market app business in terms of functionality but they have improved a lot in last few versions. What you get now is a very clean interface, easy to access information & news section. Being part of times news network, ET app provides access to one of the fastest news platform. You get customized news, analysis and data of the Indian stock market. If you like technical charts on the move, in easy to use interface, then look no further and download Investar stock market app now. It is a great app for on the move technical analysis. Depending on your subscription, you even get access to 5-min or 1-min time frame based chart too, which is pretty neat. Investar covers most of the technical indicators. On top of that, you get Pivot-point based resistance and support levels. So go ahead, download this app and see if this can be your on the move trading buddy. 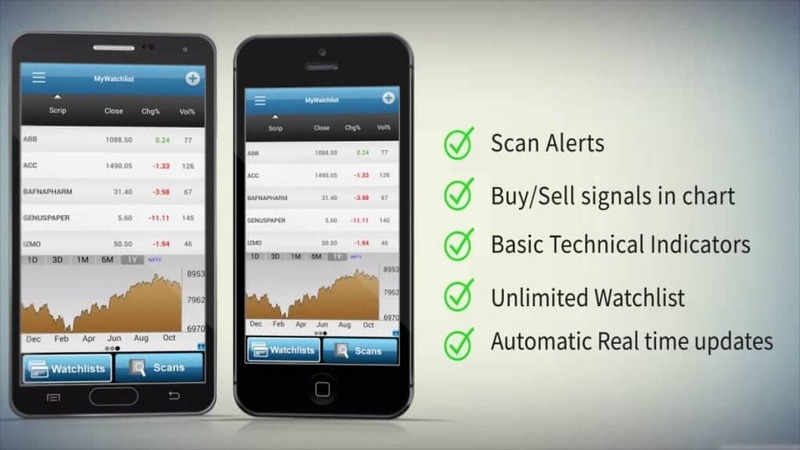 Stock watch app is one of the highest rated app on android store currently. Stock Watch offers the latest Indian stock market news, NSE futures and options, equity futures and options, BSE/NSE intraday charts, and Indian company stock quotes. Keep track of your stock portfolio with a stocks watch list. It has live stock prices (2-5 min delay) and stock market tips from market experts as a standard feature in the app. Plus, within the app, you also get a snapshot of leading global indices in one place. There we have the list of top #5 stock market app currently available in the Android store and Apple store. If you are not a dedicated trader who is trading for the living, then you need these apps to access required information from your mobile phone, on the move. This kind of access lets you stay on top of the market and your investments without having to read through lengthy newspapers, articles and all. Just keep scanning information and read in detail what is relevant when you want to. Please comment on this guide and share your feedback in comment section. You can also recommend if there is any app you want to be included in the list.